During the 2016/17 fire season in central Chile, wildfires burned about 600,000 ha, a record for the region (most of the area burned between 18-Jan and 5-Feb, 2017). Two factors are considered the main responsible of such a large area burned: (1) an intense drought with strong head waves (January was the hottest month in record), and (2) the fact that the region is covered by large and dense tree plantations that create a continuous fuel bed. The tree planted are two alien species: Pinus radiata and Eucalyptus sp., from California and Australia, respectively. Most burned area (+60%) were plantations, and if we standardize the area burned in relation to the area with each landuse in the region (plantations, native forest, grasslands, agriculture) we see that the plantations were more affected by fire than expected by their area in each region; and this contrast with the other landuses (Figure 1, ). That is, tree plantations were an important driver for the large area burned (highly flammable). Interesting is that the two species planted not only are highly flammable, they also have very good (although very different) postfire regeneration mechanisms, because both are originally from fire-prone ecosystems and have adapted to coupe with crown fires. 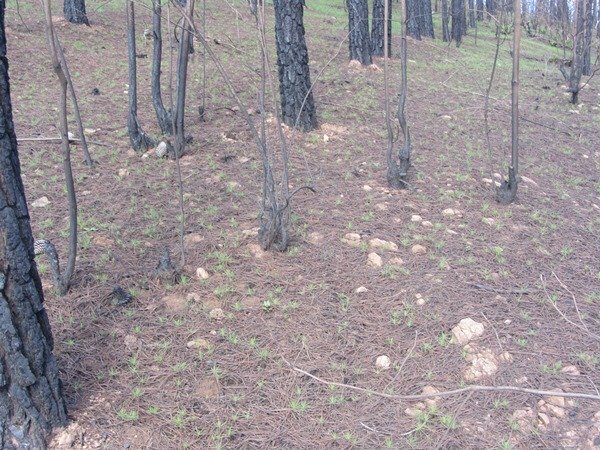 Pinus radiata have serotinous cones (closed cones that open with fire) and showed an extraordinary “natural” seedling regeneration postfire (Figure 2 top), while those eucalytps planted show epicormic (stem) resprouting that allows a quick canopy recovery (even young trees, Figure 2 bottom). All suggest that these plantations were born to burn! Figure 1: Analysis of the areas affected by fires according to types of use (forest plantations, native forest, Scrubland + pastures, and agricultural areas), in relation to what is available in each of the 4 regions that have burned the most (V, RM, VI, VII are: Valparaiso, Metropolitana, O’Higgins, and Maule). Positive data means that fire has positively selected this type of use (it has burned more than expected by the area it occupies); the negative data indicate that fire tends to avoid such landuse. 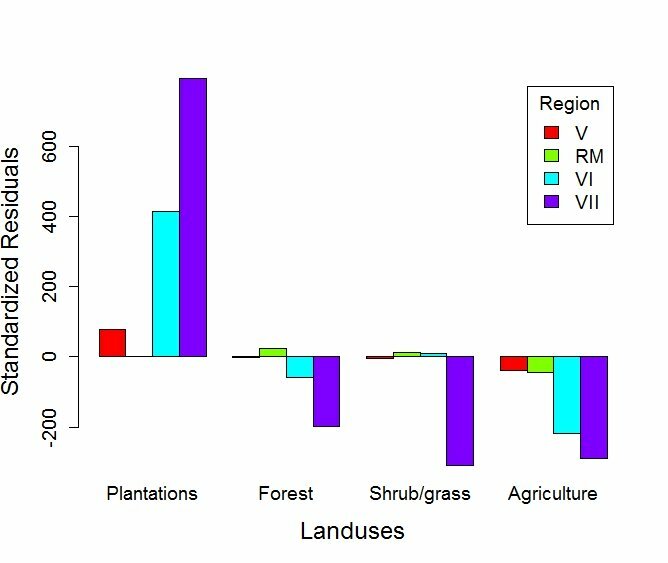 There is a strong tendency for plantations to burn more than expected according to their abundance in the landscape (positive values), while native forests, scrub, or agricultural areas are burned similar or less than expected according to their abundance (negative values). The region VII (Maule) is the most extreme in positive selection of plantations and negative of other uses. Elaborated on the basis of official SIDCO-CONAF data (Chile) . Figure. 2. Postfire regeneration of tree plantations. Top: Extraordinary postfire seedlings regeneration of Pinus radiata (adult trees are dead). 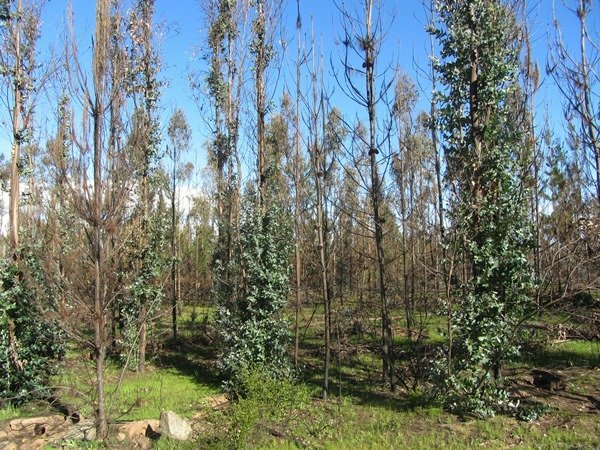 Bottom: epicormic resprouting of eucalypts (mixed with dead pines). Photos from early September (ca. 7 months after fire), in the Nilahue Barahona fire (O’Higgins region, Chile). ¡IMPORTANTE! Responde a la pregunta: ¿Cuál es el valor de 8 6 ?